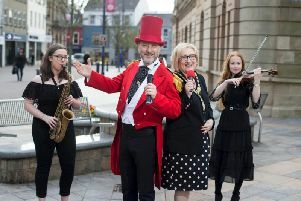 The city was buzzing with activity on Friday evening as poets, artists, singers and performers of all kinds plied their trade for audiences across Londonderry and Strabane as part of Culture Night. A wide programme of family friendly events took place throughout the city and district as part of the annual celebration, and people flocked to enjoy some of the best local talent. The Mayor, Elisha McCallion, said the evening had been a great success. “We all know that Derry still lives up to its title of City of Culture, and Culture Night is a great opportunity for people of all ages to get out there and experience new art forms in a variety of different venues. “The programme offered a wide and imaginative array of alternative and traditional entertainment and there was a great buzz about the city centre. Many of the city’s museums remained open until late to mark the celebration, with free tours and talks throughout the evening. Some of the quirkier highlights of the programme included an exhibition of dreadful LP covers titled Connoisseurs of the Dreadful, a Creative Typewriting Challenge and an exhibition of junk sculptures. Culture vultures were also treated to an Irish House Party in Cultúrlann, as well as a Circus Workshop and a behind the scenes look at the Playhouse.